Overall a great hostel with clean, large hot showers and very arty and comfortable bedrooms. It was a shame to have to pay extra for towels and breakfast (these are included in the price in some other hostels which is cool), and to have to wait until after 9.00 in the morning for breakfast - it would have been good to have been able to eat earlier. Best hostel I've ever been! One of the best hostels i ve stayed in so far. Lots of instruments, a well enough equipped kitchen to prepare your own tea, make breakfast or even cook something. The staff was very welcoming and uncomplicated. Every bes has its own little light (i know its only a smll detail but i really do find that something simple and very effective) The beds are comfy (nice blankets as well) and the bathroom was always very clean. I would defenitely come back. Loved this place! So relaxed, amazingly friendly staff and a great location. Would 100% recommend, I'm hoping to go back! 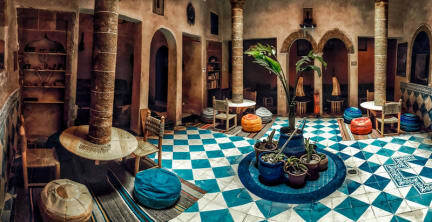 Very charming hostel right in the medina. Minutes away from everything. The staff was very friendly. The atmosphere was spot on and everything was very clean. One of the best and most social hostels i've ever stayed at. Perfect size, tasty breakfast & dinner, amazing rooftop, ... just all you need. Shout-out to Pierre and the rest of the staff! I enjoyed my stay at Chill Art. It's in the heart of the Medina, staffed by very cool people, and it's . I actually slept really well, and that doesn't often happen for me in hostels. 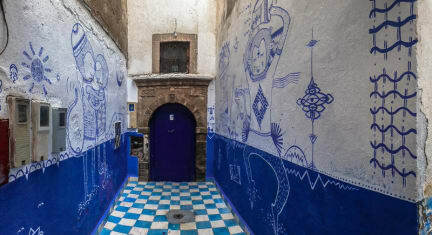 I really liked the terrace, the place had good wifi, the other guests were all very cool, and I even booked a hammam and massage through Chill Art. When I return to Essaouira, I'll come back here. Fantastic hostel!! Great location, neat, chilled atmosphere, great staff & crowd!! One of the best hostel I have stayed in. Definitely would recommend a stay there, if you manage to get a room since the hostel seems quite popular. 6 stars! Pierre and Nadia are doing are close-to-perfect job, everything was very relaxed. Individual bed lamps, curtains and plenty bathrooms were a plus for me. The roofrop is not big but it has an actual view on the sea and the stray cats below on. The other buildings : P. Fridays Couscous was amazing and there was a daily and varying breakfast variation you could book as an extra. The location is quiet convenient but I guess you can t do much bad about that in Esaouria. Overall: I liked it!